The Butler/William Ganong Cemetery is perhaps one of the most written about cemeteries in the state of Michigan because of the countless claims it is haunted with active paranormal encounters. The most common claim is the sighting of a literally traffic stopping blonde beauty in white who appears in the road in front of travellers, causing cars to swerve to avoid hitting her. The cemetery was donated by a local farmer in 1832 from a portion of his property to be used for burials. It is home to 350 deceased and is now closed to new burials. Among those buried are 25 of the Ganong family, several World War I and II veterans, one veteran of the Mexican-American Warand numerous Freemasons. Albert Ganong, who perished in Libby Prison at age 17 is among the veterans buried there. The cemetery is now owned by Wayne County. 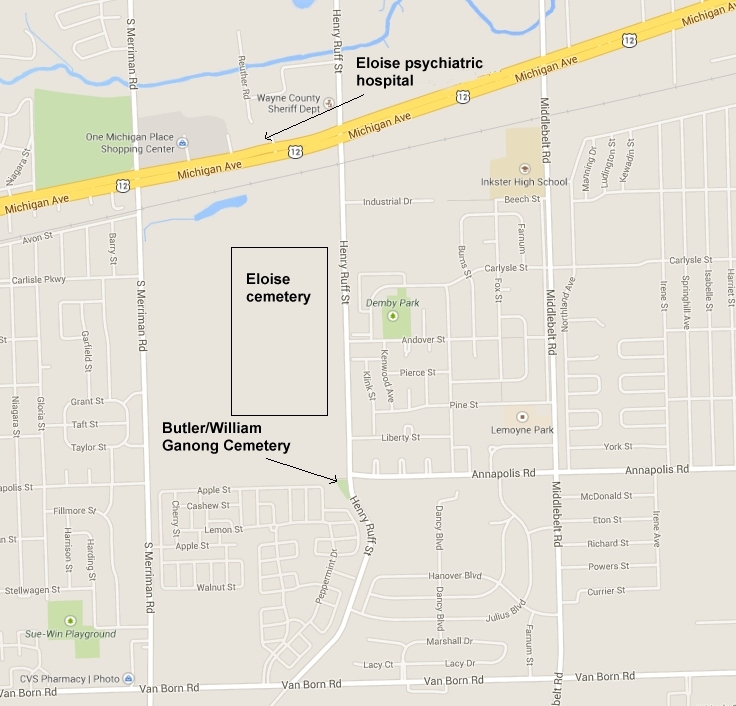 Very close to the Butler/William Ganong Cemetery is the infamous Eloise Asylum and Eloise Cemetery, now marked as with a Michigan Historic Marker. Eloise refers to the former large hospital complex located in the City of Westland (Wayne County), MI. It operated from 1839 to 1984 and started out as a poor house and farm, but developed into an asylum and hospital. It has gone by many names over the years: the Wayne County Poorhouse (1832), Wayne County Alms House (1872), and Wayne County House (1886). In 1913 there were three divisions: The Eloise Hospital (Mental Hospital), the Eloise Infirmary (Poorhouse) and the Eloise Sanatorium (T.B./Tuberculosis Hospital) which were collectively called Eloise. In 1945 it was named Wayne County General Hospital and Infirmary at Eloise, Michigan. The psychiatric division closed in 1977 and in 1979 it was officially called Wayne County General Hospital. At its height, Eloise consisted of 78 buildings and 902 acres. The name Eloise came from the post office on the grounds which opened July 20, 1894 and was named Eloise after the postmaster of Detroit's daughter, Eloise Dickerson Davock. Eloise Cemetery was the name applied to cemeteries used by the Eloise hospital. The patients buried in the cemetery were from the Infirmary Division, the William P. Seymour General Hospital, the Tuberculosis Sanatorium (Tuberculosis was the leading cause of death at the time), and the Eloise Hospital - Psychiatric Division. About 7,100 people were buried in the Eloise cemetery between 1910 and 1948. These were patients who died at the institution and had no known relatives and/or relatives who were unwilling or unable to bury them. Only numbered blocks identify the graves. After 1948 all unclaimed bodies were sent to the Wayne State University College of Medicine and no further burials were made there. The names of over 4,000 of the 7,100 people buried in the cemetery have been added to Find A Grave, www.findagrave.com. Many of the names of patients sent to the Detroit College of Medicine and Wayne University School of Medicine are also on www.findagrave.com. At earlier times, that is in the 19th Century, the cemetery as the source of cadavers, after body snatching, which were used by medical students at the University of Michigan. From 1948, the laws were changed so that the hospital became a ready source and bodies were sent to Detroit Medical College. The cemetery is currently closed to the public and maintained by the Friends of Eloise. The site and the adjoining asylum are reputed to be haunted. The field lay forgotten and neglected, especially since the last burial (in one of the three plots) was in 1948; it now stands in the way of other uses, and is seen as a responsibility by Wayne County commissioners who are perplexed over use of the Eloise site. The presence of over 7,000 marked but unnamed graves - and the absence of many supporting records - is potentially an insuperable obstacle to any future development. The hospital complex was once almost self-sufficient. It had its own police, fire department, railroad and trolley stations, bakery, amusement hall, laundries, and powerhouse. It also had many farm buildings including a dairy herd and dairy barns, a piggery, a root cellar, a Tobacco curing building, and employee housing. Eloise was one of the first if not the first hospital to use x-rays for diagnosis preformed by Dr. Albarran. Patients came from Detroit and other communities to have x-rays done. It also housed the first kidney dialysis unit in the State of Michigan and pioneered in the field of Music Therapy. As the years went on the institution grew larger and larger, a reflection in the increases in the population of the Detroit area. From only 35 residents in 1839 the complex grew to about 10,000 residents at its peak during the Great Depression and then started to decrease. Much of the land that Eloise stood on has been re-developed and is now a strip mall, a golf course, and condominiums. However, 4 buildings remain: "D" Building or the Kay Beard Building, the old commissary building	shelter. the old bakery, and the power house. Eloise smokestack (emblazoned Eloise in brick) was deemed to be a hazard and was demolished in 2006. In 1979, the Walter P. Reuther Psychiatric Hospital, located near the northwest end of the former Eloise property, just southeast of the intersection of Merriman and Palmer Roads, was opened. The facility is currently operated by the Michigan Department of Community Health. In 1996, Oakwood Health System opened an outpatient facility, the Adams Child & Adolescent Health Center, on the corner of Merriman and Palmer near Reuther Hospital. Both facilities have Palmer Road addresses. Amazon page on Marion Kuclo's book "Michigan Haunts and Hauntings"